Complete feed for laying chickens. Finishing feed for turkeys and a supplement for broiling chickens. Finishing and maintenance feed for ducks and geese. Corn, Soybean Meal, Wheat Middlings, Calcium Carbonate, Soybean Oil, Dicalcium Phosphate, Salt, DL-Methionine, Vitamin A Supplement, V itamin D3 Supplement, Vitamin E Supplement, Niacin, Vitamin B-12 Supplement, Riboflavin, d-Calcium Pantothenate, Folic Acid, Pyridoxine Hydrochloride, Menadione Dimethylpyrimidinol Bisulfate Complex (source of Vitamin K activity), Thiamine Mononitrate, d-Biotin, Manganese Sulfate, Ferrous Sulfate, Copper Sulfate, Zinc Sulfate, Sodium Selenite and Ethylenediamine Dihydriodide. 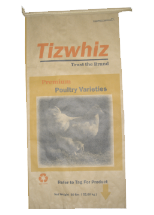 Pullets should be started on Tizwhiz Start-n-Gro 24% until at least 6 weeks of age. At 6 weeks you may change to Tizwhiz Select Layer Crumbles 16%. Oncehens begin to lay and throughout the laying period, offer oyster shells free choice to ensure optimal eggshell quality. 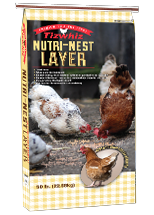 If pullets experience times of extreme cold or stress, it is recommended that you offer a mixture of equal portions Tizwhiz Start-n-Gro 24% and Tizwhiz Select Layer Crumbles. For the first 5 weeks, feed broilers Tizwhiz Start-n-Gro 24%. After 5 weeks you may mix in equal portions Tizwhiz Start-n-Gro 24% with Tizwhiz Select Layer Crumbles. Turkeys: For the first 10 weeks, feed Tizwhiz Start-n-Gro 24%. After 10 weeks, you may begin feeding Tizwhiz Select Layer Crumbles. Feed ducks for 2 weeks Tizwhiz Start-n-Gro 24%. From 2 weeks on, feed Tizwhiz Select Layer Crumbles. Start geese onTizwhiz Start-n-Gro 24% until 6 weeks of age. At 6 weeks, you may change to the Tizwhiz Select Layer Crumbles. Starter feed for young poultry. Corn, Soybean Meal, Wheat Middlings, Wheat Flour , Dehydrated Alfalfa Meal, Calcium Carbonate, Dicalcium Phosphate, Soybean Oil, Salt, DL-Methionine, Vitamin A Supplement, Vitamin D3 Supplement, Vitamin E Supplement, Choline Chloride, Niacin, Vitamin B-12 Supplement, Riboflavin, d-Calcium Pantothenate, Folic Acid, Pyridoxine Hydrochloride, Menadione Dimethylpyrimidinol Bisulfate Complex (source of Vitamin K activity), Thiamine Mononitrate, d-Biotin, Zinc Sulfate, Ferrous Sulfate, Manganese Sulfate, Copper Sulfate, Ethylenediamine Dihydriodide, and Sodium Selenite. For the first 5 weeks, feed broilers Tizwhiz 24% Start-n-Gro. After 5 weeks, you may mix Tizwhiz 24% Start-n-Gro in equal portions with Tizwhiz 16% Poultry Layer. Corn, Milo, Oats and Wheat. Grain that may be fed in a feeder of thrown onto the ground as an all natural source of non-processed grain.